A lovely Southern Cake for a Southern Gentleman! Lest you think we’ve eaten nothing but cake for a week, this one was made for John’s final birthday celebration with my family. Although I remember my mom making “Seven-minute Frosting” when I was a kid, I’ve never made it myself. Apparently, I didn’t beat it quite long enough because it ran a bit and didn’t quite set up – of course, this didn’t detract from the flavor and my family loved it just the same. 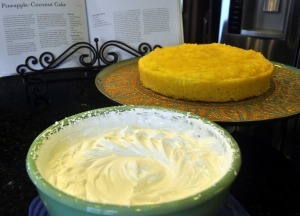 This recipe comes from Nancie McDermott’s Southern Cakes which I picked up in Charleston. The cake is a lovely, moist yellow cake that is easy to make and just a great basic. The center of the cake holds a cooked pineapple filling, then the whole lot is draped in Fluffy Pineapple Frosting, and topped with coconut. It’s really wonderful. You can find the recipe here. Coconut and pineapple! Yum. 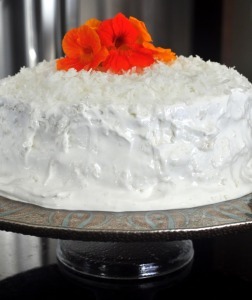 The cake looks so pretty with the coconut on top. What a great cake celebration!! Susan Lester, you are sweeter than a fresh ripe pineapple. This makes me so happy and so proud and so grateful. 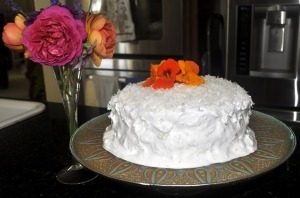 The cake looks lovely, and I adore homemade birthday cakes, even ones not as gorgeous as this one. Happy Birthday to John, and many many more. And now I am going to check out your posts on ‘taters from Lyon and that crab eggs benedict…I like this place!